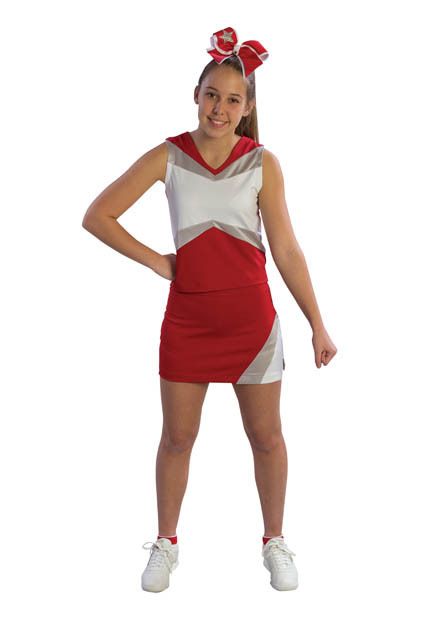 Cute and affordable cheerleading outfit includes stretchy v-neck shell with contrasting middle panel with matching tumble skirt and briefs. 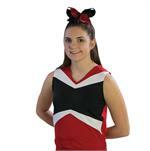 Shell & skirt have matching 2 - color insert trim. 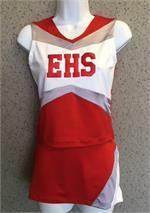 Add 3 large block twill letters on front for $6 as shown. Or, add a one or two color twill word using the link below. Girls XS 18-20" 20-22" 10"
Girls Small 21-23" 23-25" 11"
Girls Medium 24-26" 26-28" 12"
Girls Large 26-28" 28-30" 13"
Womens Small 22-24" 30-32" 13"
Womens Medium 25-27" 33-35" 13"
Womens Large 28-30" 36-38" 14"
Easy ordering! Use our Cheer Roster by entering each girl's name, shell size & skirt size (use GL for girls large, WS for women's small, etc) and we will label each package for you so you don't have to sort the items yourself! Or, if you'd rather do it yourself, feel free to use the roster by simply listing your sizes (Shells 6 GXS, 4 GS, 5 GM, etc). If you have any questions, email michelle@acdsports.com . Sizes may sell out, so order ASAP. If any of your sizes are on backorder, we will email you within 1 day of receiving your order so we can come up with a Plan B of outfitting your squad in time.